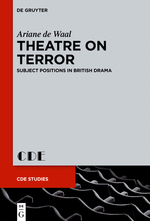 Theatre on Terror: Subject Positions in British Drama. Berlin/Boston: Walter de Gruyter, 2017. In a moment of intense uncertainty surrounding the means, ends, and limits of (countering) terrorism, this study approaches the recent theatres of war through theatrical stagings of terror. Theatre on Terror: Subject Positions in British Drama charts the terrain of contemporary subjectivities both ‘at home’ and ‘on the front line’. Beyond examining the construction and contestation of subject positions in domestic and (sub)urban settings, the book follows border-crossing figures to the shifting battlefields in Iraq and Afghanistan. What emerges through the analysis of twenty-one plays is not a dichotomy but a dialectics of ‘home’ and ‘front’, where fluid, uncontainable subjects are constantly pushing the contours of conflict. Revising the critical consensus that post-9/11 drama primarily engages with ‘the real’, Ariane de Waal argues that these plays navigate the complexities of the discourse – rather than the historical or social realities – of war and terrorism. British ‘theatre on terror’ negotiates, inflects, and participates in the discursive circulation of stories, idioms, controversies, testimonies, and pieces of (mis)information in the face of global insecurities.